Check your weight gain progress weekly rather than daily. Whether you want a curvier body or a bigger frame for athletics, raising your caloric intake and metabolism are the best ways to gain healthy weight. To gain size the right way, you need nutrients from whole foods -- which means not filling your belly with takeaway pizza and all-you-can-eat buffets. Consuming more calories along with exercise ensures that you gain weight in the right places -- think of it as body sculpting. With a diet plan and a scheduled exercise regimen, you can gain size and still rock a bikini. Increase your calorie intake to gain size. By increasing your intake by 500 to 1,000 calories daily, you can gain 1 to 2 pound of weight weekly -- this is safe and efficient weight control, according to Diversified Health Occupations. A 500-calorie dinner can include one serving of chicken breast with a Greek salad followed by a portion of fruit crumble and plain yogurt. Eat meals more regularly and keep the portions small. Have five to six meals daily, consume them every two to three hours and stick to nutrient-dense fats, protein and carbs. Choose plant fats such as almonds, seeds, avocados, unsalted peanuts and hummus. Eat slow-digesting lean proteins such as turkey, chicken breast beans and lentils for muscle recovery. Complex carbs provide energy and nutrients; these include brown rice, whole-wheat pasta, green vegetables and fruits. Increase your metabolism on a long-term basis with strength-training exercises. Building muscles gives you a higher degree of control over your weight gain because muscles burn more calories than fat. Schedule strength-training sessions two to three times every week on non-consecutive days. Sculpt your whole body by targeting the major muscle groups in your arms with bicep curls, legs with lunges and calf raises, chest with bench press, abs with crunches and shoulders with the dumbbell lateral raise. Break down your muscle tissue by lifting 60 to 70 percent of your one-rep maximum, which is the most weight you can lift in one repetition. Perform eight to 12 repetitions of each exercise in two or three sets. Raise your metabolism and reduce fat with regular cardiovascular exercise. 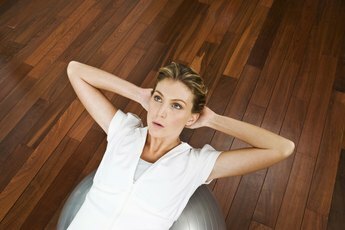 The goal is to gain weight, so you should keep cardio exercise to a minimum. The McKinley Health Center at the University of Illinois at Urbana-Champaign recommends that you keep cardio exercise sessions to about 20 to 30 minutes and of moderate intensity. Brisk walking is a form of moderate exercise that only requires light clothing and running shoes. Other forms of moderate cardio include jogging, cycling and swimming. Prepare for strength or cardio exercise sessions with a quick warm-up; it takes only five minutes and may help prevent muscle injury. By taking short sprints or jogging on the spot for five minutes, you are warming up your blood and muscles, which improves your muscle tissues' flexibility and endurance. Diversified Health Occupations; Louise M. Simmers, et al. Can You Have a Flat Stomach With a Short Torso?